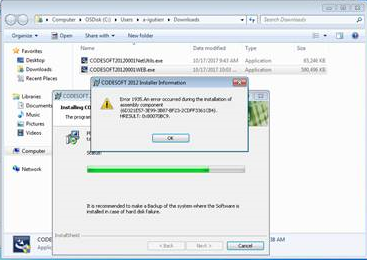 This article explains the CODESOFT error message “Error 1935 An error occurred during the installation of assembly component” and details how to fix the underlying problem that caused it to appear. Windows installer lacks proper features to complete the installation. We suspect that a background installation shell interfered with the installation. Confirm that you have met all the software requirements before trying the installation again. Please pay particular attention to the .NET components.